Motorcycle & ATV Audio. Car Video & Navigation. DJ & Pro Audio. Home Audio & Video. Cell Phones & MP3 Accessories. Marine Bluetooth Radio, 4x Kicker 4 Boat Speakers. 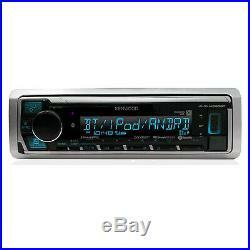 Kenwood Marine Digital Media Bluetooth Receiver, 4x Kicker 4 Boat Speakers. Brand New – Original Packaging. Package includes a total of 4 Speakers. Kenwood KMR-M325BT KMRM325BT KMRM325 Marine Digital Media Bluetooth Receiver (No CD). The 2019 Kenwood KMR-M325BT will make listening to music will be all the more pleasure some. You can utilize the convenience of hands free calling as well as wireless music streaming with its built in Bluetooth® function. With Kenwoods Drive EQ technology your tunes wont be effected by waves, wind or surrounding noise. You can play a selection of file formats including AAC files or you can stream your selected tunes on iHeart Radio, Spotify and Pandora. If all that is not enough you can always add a thumb drive into the front-panel AUX Input and enjoy MP3, WMA, WAV or even FLAC files. The variable-color 1.5-line LCD Display keeps your song titles and channel information easily displayed. The convenient front panel USB input provides access to your playlists. Plugging in your iPod or iPhone will enable an abundance of functions. Button specifics like search and return, plus useful tools like Alphabet, Percentage Skip, and Related Search, help you get to your music faster. For Siri-equipped iPhones you can have full Siri Eyes Free control. In addition Connect up to 5 Bluetooth® devices simultaneously, so you and your friends can take turns streaming music like a DJ. Move to the groove and get the party pumping to the max. If youre a satellite radio fan, add a SiriusXM tuner (subscription required) and enjoy music, sports and news while youre far from shore. The receiver boasts three sets of preamp outputs, so you can always add on an amplifier to your system. Kenwood offers the option of adding up to six Kenwood marine wired remotes so that you can keep the stereo installed below deck and control it at your convenience. Note: This unit does not play CDs. TDF(Theft Deterrent Faceplate). Maximum Output Power : 50W x 4 (MOSFET Power IC). KENWOOD sound reconstruction, restores musical to compressed music. MP3/WMA/AAC/WAV/FLAC Files Playback with ID-3 Tag Display. Multi language(English, Spanish). Front USB and AUX IN. 3 Preouts 4.0V. In the market for high quality products? Don’t settle for less than you deserve. The right sound and design will give you all the more entertainment. 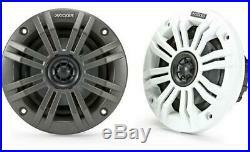 Our premium brands such as Rockford Fosgate, Kicker, JBL, Lightning Audio, and Jensen are some of our quality products. Attention to design and manufacturing quality are displayed to ensure crystal clear sound without any interference. Our Kicker and Rockford as well as other brands have been featured in demo vehicles with viewers being blown away on their performance and sound output. Our experience has demonstrated that most cars, boats, yachts, bikes, motorcycles or side by sides can get that show stopping, jaw dropping sound output, it all depends on the right speaker or amplifier to do its job. Kicker KM4 4-Inch (100mm) Marine Coaxial Speakers with 1/2-Inch (13mm) Tweeters, 4-Ohm, Charcoal and White Grilles (x2). 45KM44 Kickers 45KM44 4 marine grade speakers emit great sound and appeal on any boat. Perfect for life at sea, these speakers are constructed with sealed motors, rubber cone surrounds and locking terminal covers to keep the internal components safe. They’ll be ok under harsh sunlight, due to special UV treatments on the cones, surrounds, baskets and grilles. Wherever you take them, those speakers will provide years of perfect performance. The Kicker 45KM44 speakers are strong for marine use yet easy on the ears. The tough poly woofers and balanced dome tweeters plow through wind, waves and engine roar to provide you with clear sound without any roughness. The package includes white and Charcoal grilles that are interchangeable to match any interior. Whether you mount them up top or install them in custom enclosures, Kicker 45KM44 speakers will make your time at sea that much more entertaining. 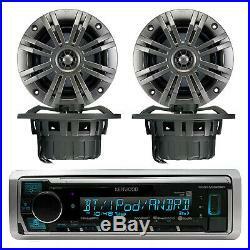 Pair of Kicker 45KM44 4 150W Peak / 50w RMS 4-Ohm 2-Way Coaxial Marine Speakers. Tweeter Dome Material: PEI (Polyetherimide). Frequency Response: 60-20,000 Hz. Designed Specifically for a Marine Environment. Bold Stylish Charcoal Grille Design. Cutout Dimensions: 3.81. Top-Mount Depth: 1.87. For your convenience, have us address all your questions and concerns prior to purchasing. At Road Entertainment we do everything for assuring you a smooth and fun shopping experience. You’re therefore eager to actually have it, see it, and hold it in your very hands. For heaven’s sake, you want to use it, like immediately, right? Need your order sooner? APO/FPO addresses and other U. For the most part, orders will be delivered to APO/FPO addresses and U. Marking items as a gift is unlawful and US and International government regulations prohibit such behavior. We’re doing our utmost to provide you with a smooth and easy return-process. Please note: US and International law prohibits us from marking items as “gifts”. How to return an item? If the need for returning an item arises, either because of a change in mind or in the unlikely event of the product arriving with a defect, you can do so by following a few short and simple steps. Get your Return Authorization. Please call if the return involves a defective product. Place the item, it’s accessories and manuals in the original packaging. So please be sure to use them when returning an item. Remove or mark out the original labels, and secure one completed label to each package. For nearest location visit ups website or call on ups toll free number. After receiving your package, we will immediately start the process of exchanging or refunding your order. We’re doing our utmost to provide you with a smooth and easy return process. Road Entertainment has been connecting consumers and enthusiasts of personal, mobile, and marine audio/video, equipment, tools and toys to the right product since its inception in 2003. We pride ourselves with our unique approach of customized E-packages suiting your specific audio and video needs for turning your home entertainment, road ride, or boat adventure into a joyous experience. At Road Entertainment, we’re sparing you the hustle and hassle of endlessly searching and sifting for the product you’re looking for. You’ll be thrilled by the user-friendly and an at-your-fingertips selection of customized packages and kits, fitting your specific home, car, truck, boat, and ATV entertainment needs. What should you be expecting when setting out to browse our website? Basically, anything and everything relating to mobile audio and video products, tools, equipment, and systems, as well as a dazzling selection of consumer electronics from world-renowned brands at the most compatible prices. Such are the facts and this is what you could and should expect. Whether it’s rocking your party boat or music for a yoga class on the grass; tunes for your kids’ birthday bash or a Tuesday night Zumba class, we got the perfect product to fulfill your desire. Let us know what you have in mind, and we’ll speedily put it together and over get it to your doorstep at the most reasonable prices. Our agents work around the globe as well as attend all major trade shows to bring you the best possible listening and viewing options this ever-changing and constantly evolving industry has to offer. You will find the results of this tireless team-work in Road Entertainment’s ever-changing and constantly updated stock. Congratulations on joining our satisfied customer base, and talk to us anytime about anything in the business! We welcome your inquiry! Please bookmark us to your favorites list and visit often! All brand names, logos, and trademarks referenced on this site remain the property of their respective manufacturers/owners. We’re not responsible for typographical or illustrative errors. All sales are subject to approval by Road Entertainment. Details about Enrock Marine 6.5 High Performance Speakers (Black / White / Charcoal). Details about Enrock Audio Marine Grade Antenna, Various Size and Applications. Details about Enrock Audio Car / Marine 50 Foot Installation Speaker Wire. Details about Enrock Marine Single-DIN Car Boat Radio Dash Kit Protectors (Black / White). The item “Marine Bluetooth Radio, 4x Kicker 4 Boat Speakers” is in sale since Friday, May 20, 2016. This item is in the category “Consumer Electronics\Vehicle Electronics & GPS\Marine Audio”. The seller is “roadentertainment” and is located in Newburgh, New York. This item can be shipped to United States.